Radiological damage to microbes near the site of the Chernobyl disaster has slowed the decomposition of fallen leaves and other plant matter in the area, according to a study just published in the journal Oecologia. 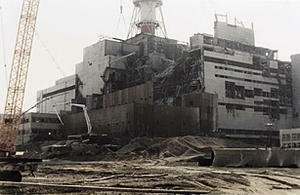 The resulting buildup of dry, loose detritus is a wildfire hazard that poses the threat of spreading radioactivity from the Chernobyl area. A University of South Carolina release reports that Tim Mousseau, a professor of biology and co-director of the Chernobyl and Fukushima Research Initiatives at the University of South Carolina, has done extensive research in the contaminated area surrounding the Chernobyl nuclear facility, which exploded and released large quantities of radioactive compounds in the Ukraine region of the Soviet Union in 1986. He and frequent collaborator Anders Møller of Université Paris-Sud noticed something unusual in the course of their work in the Red Forest, the most contaminated part of the Chernobyl Exclusion Zone. They set out to assess the rate at which plant material decomposed as a function of background radiation, placing hundreds of samples of uncontaminated leaf litter (pine needles and oak, maple and birch leaves) in mesh bags throughout the area. The locations were chosen to cover a range of radiation doses, and the samples were retrieved after nine months outdoors. A statistical analysis of the weight loss of each leaf litter sample after those nine months showed that higher background radiation was associated with less weight loss. The response was proportional to radiation dose, and in the most contaminated regions, the leaf loss was 40 percent less than in control regions in Ukraine with normal background radiation levels. They also measured the thickness of the forest floor in the same areas where samples were placed. They found that it was thicker in places with higher background radiation. The team concluded that the bacteria and fungi that decompose plant matter in healthy ecosystems are hindered by radioactive contamination. They showed a smaller effect for small invertebrates, such as termites, that also contribute to decomposition of plant biomass. According to Mousseau, slower decomposition is likely to indirectly slow plant growth, too, given that the products of decomposition are nutrients for new plants. The team recently reported diminished tree growth near Chernobyl, which he says likely results both from direct radiation effects and indirect effects such as reduced nutrient supply. The results also show the potential for further spread of radioactivity. “There’s been growing concern by many different groups of the potential for catastrophic forest fires to sweep through this part of the world and redistribute the radioactive contamination that is in the trees and the plant biomass,” Mousseau says. “That would end up moving radio-cesium and other contaminants via smoke into populated areas.